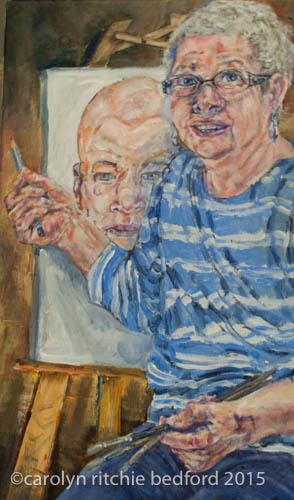 This portrait was painted during the year of cancer treatment and chemotherapy. It was finished at end of chemo just as artist's hair started to come back. Within the painting is a self portrait drawing of the artist in chemo without hair. This work was done so that artist could be given strength through her art despite weakness and to tell all that she was coming back.